Earn 4.5 SB per $ when you buy Sephora gift cards at MyGiftCardsPlus, powered by Swagbucks. Sephora carries the best brands in makeup, skincare, fragrance, and hair care. With over 13,000 products and 500 brands, Sephora is the leading beauty retailer. 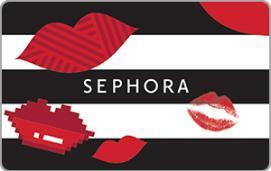 eGifts are redeemable in over 500 Sephora stores and Sephora Inside JCPenney, as well as online at Sephora.com.